What do you have a creative flair for? A lot of people wish they were creative, but think they can’t be. Yes, you can! I make learning to sew, paint, or draw fun and approachable, giving you both creative confidence and technical skill to bring your dreams to life. 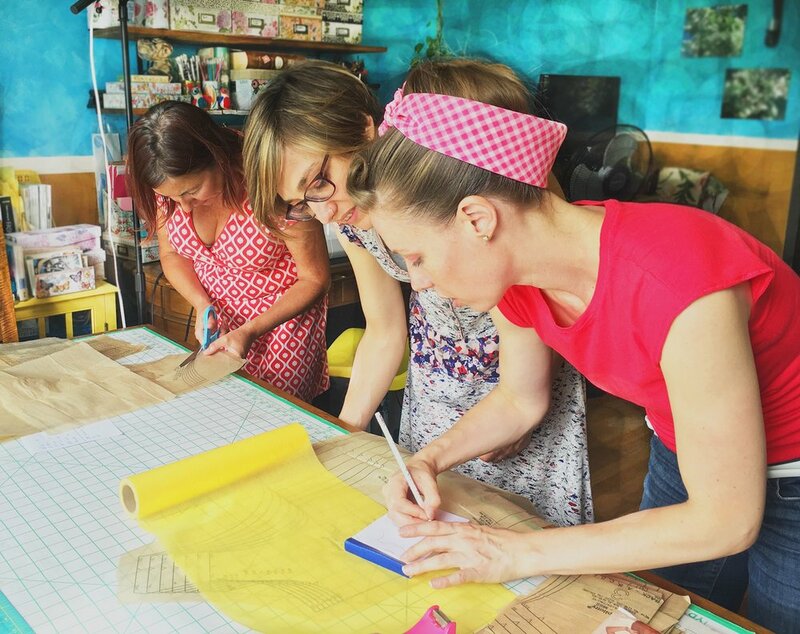 Whether you want to paint or sew, there’s a creative class for you. Group classes and private lessons are available for adults and kids in upper Manhattan. Want to test my upcoming online class? I have a few select spots available for free - you just need to give me feedback! Email Rachel for more information. Find your flair with art, sewing, and fashion design classes for kids and adults in uptown NYC. This student is showing off her first sewing project, a throw pillow cover. Didn't she do a great job? When you’ve had some practice, you can even sew your own coat. People will stop you on the subway to ask where you got it. Beginning and intermediate sewing and art classes for adults and kids coming this spring. Sewing patterns and online classes will be coming very soon . . . if you want to be a tester, email me! Custom clothing fit to your body and designed just for you, made in NYC. What's your style? I learned to sew as a little girl in the 4-H club I was part of in Boulder, Colorado. My mother led the group and we learned on a terrible, cranky old monster of a machine. But we did learn. The day I wore a beautiful new dress for the first day of fourth grade, I felt so proud of my achievement. I remember these early years of sewing as being rewarding and confidence building for me, and I want to bring that joy to others as well. The joy of creating is infectious, and I just couldn't stop making things. Over the years I accumulated more skills through reading books by esteemed authors, trying out new experiments of my own, and practice, practice, practice. Though I am almost entirely self-taught, I have professional-level experise, specializing in pattern design and couture quality construction. I am also a mostly self-taught artist, but I did have the most wonderful art teacher named Mr. Davis when I was a high school student. Mr. Davis had infinite patience and kindness, and had knack of helping me get past those moments of feeling stuck that really unlocked doors for me as an artist. I learned things from him that I continue to pass on to my students now. Most of all, I believe we learn from other people, and by trying new things - whether it be observation, taking a class, reading a book, watching a video, or simply getting out the sewing machine or the paint brushes and having a go. Try it! It's fun. The best thing about creativity is it's not meant to be taken too seriously. It's about expansion and opening up to new things. Even mistakes can be a beautiful part of the creative process. I taught in NYC middle school classrooms for eight years full time, teaching everything from French to English to music. Even though I didn't teach art or sewing as a subject matter, I enjoyed bringing art into my classroom whenever possible. I have had experience teaching young children through college aged students, I have taught gifted and special needs students, and I hold a graduate degree in education and K-12 New York State teaching licenses. My favorite moments as a teacher were always the ones when a student who didn't believe he or she could do something took a chance and discovered, yes! I can do this! And so can you. Whether you believe you are creative or not, if you have aspirations to becoming more creative, I can help. I make learning to sew, paint, draw, and make jewelry fun and accessible. My wish is for every student to leave my class with a big smile and pride in their achievement. So far . . . I have achieved my goal! I'd love to help you do the same. Imagine what you could create!